PRESS RELEASE: Castries St Lucia, July 23, 2018: The South Castries Youth and Sports Council would like to congratulate the South Castries Lions on a well-deserved victory over the Avatar City blasters in the SPL T20 finals which took place on the July 22nd. South Castries has come a long way from last year’s tournament. 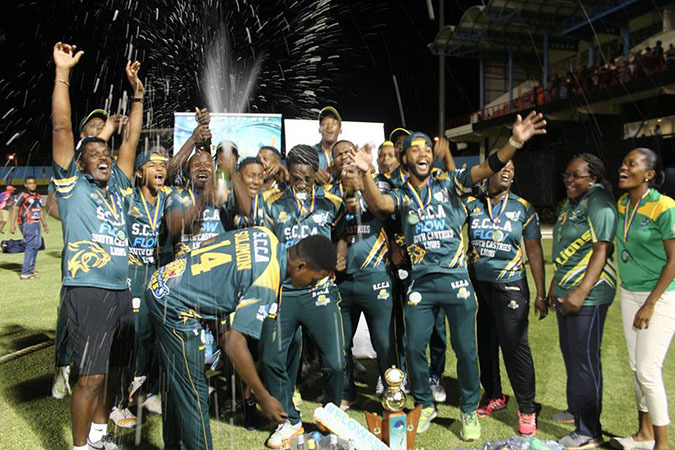 In the 2017 Edition of the SPL T20 South Castries lost all their matches. They struggled to find rhythm last year but struck all the right moves in this year’s edition. This only stands to prove, that hard work always yields results. We would like to admonish them to keep pressing forward and they will no doubt harvest a plethora of success in the future. We would also like to recognize the hard work of the President of the South Castries Cricket Association Mr. Bryan Calixte. Under his leadership the South Castries Cricket Association became owners of the South Castries Lions Franchise and became the only team to obtain the services of a non-St Lucian international player, in the person of Andre Fletcher, whose contribution to the team’s performance proved invaluable. Despite the fact that the major cricket fields within the district are not up to standard, and have not been for a considerable amount of time, Bryan Calixte was able to use his sagacity and experience to procure a tournament winning side for the franchise and provide them the training and mentorship they needed. He was ably assisted by Mr. John Eugene West Indies A and Stanford T20 player and the other administrative personnel who demonstrated that South Castries Cricket is alive and well. The Conditions of the fields within the South Castries District continues to be an eye soar for many constituents and both Parliamentary Representatives, Mr Guy Joseph and Mr. Ernest Hilaire have given their word that they are willing to work with the Youth and Sports Council to ensure that the young people, athletes and constituents of the South Castries district will receive better playing conditions and better fields in the near future. We will continue to lobby on behalf of the constituents in such matters as we believe that in order for us to sustain and develop the talents of young people, we need the tools and facilities to do so. Cheers Lions. Continue to Soar! Continue to Roar!